What is Waste Disposal ? Waste disposal is a service that helps homeowners and business get rid of waste. TrashKing.ca is a local waste disposal company that specializes in doing exactly what they promise every-time. Waste management services are provided on a best guess delivery system. Our bins have been involved in projects ranging from single office clean outs on moving day to ongoing waste disposal on a schedule. Rather than promise you a delivery at a certain time, we give you a time window for delivery such as 0800am to 1000am. During busier times of year our residential waste disposal services are delivered in four-hour time windows such as 0800am to 1200pm. Don’t worry, you won’t have to be onsite when the waste disposal bin is dropped off. With a little communication, we are very good at getting bins placed on your property in the spot that makes sense for the project. 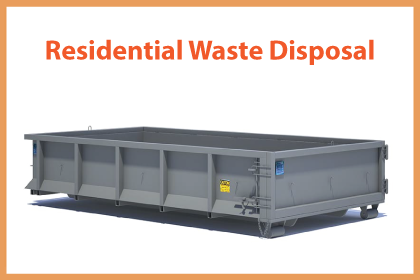 If you communicate with our waste disposal dispatch team, we can also get you disposal bins delivered multiple times during the day for those larger, time sensitive job sites. When you are managing multiple properties and strata organizations, efficient waste disposal systems are key to ensuring the greenest footprint for your clients and best community publicity to grow your brand and property management service. When developers buy a property, often there is extensive removal of either land and brush or ( earthworks ) or removal of unwanted items and property left by previous owners, tenants or partners. Commercial Retail Construction contractors use our waste disposal services for jobs that requires after-hours delivery and pick up. Often clients in retail mall space have to complete their renovations during the hours when the mall is closed. 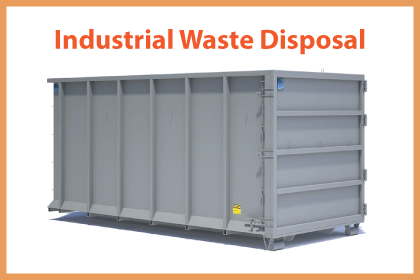 This can result in large of amounts of new construction waste in a short period of time to obey municipal regulations and hours of transfer station operation. The roofing industry uses our drop off disposal bins when they tear down a residential roof made of cedar shake or asphalt shingles. Our roofing contractors also use our waste disposal services while building a new roof for excess materials. One the services the we provide the industry is same day waste dumpsters and multiple bins on site for rapid disposal during production line project management. These are the curb-appeal specialists who dig up old gardens, flowerbeds and shrubs and put in new fences, retaining walls, and raised garden beds. These specialty contractors who turn your front and side yards into the curb appeal that raise the value on your homes. These landscapers often have their own landscape equipment but use our earth recycling bins to move aggregate, top soil and green waste bins to recycle tree trimmings and branches from pruning and shaping your foliage and g...reen space. Landscaping Companies have been known to carry their own dump trucks for smaller projects. Sometimes, there is more volume of soils and aggregate then their fleet of mini dump trucks can handle. Also, our bins can sit on site and be filled by laborer’s thus increasing their daily capacity by 5 or 10 times with very little overhead. We can accommodate working with your contractors and partners or whomever else will need disposal services on your property. Whatever your needs, we have... an inventory of bins perfect for your next real estate clean out. Hard Landscape Contractors use our waste disposal services to remove the unnecessary rough lumber, landscaping ties and other deck, fencing and patio construction waste from their residential landscaping projects. We sometimes haul sod, top soil, earth and fill for them too. Usually these companies, have their own small haul dump trucks, and use us for rush projects or larger projects that require sensitive timing. Earthworks Companies use our services to haul waste from their residential property developments. If they have to remove unwanted materials and then replace them with higher quality components, sometimes we help them recycle or dispose of whatever site waste they generate. Everything from lunches and general office trash to excess materials, shrubs, and tree trimmings. Our earthworks customers usually have their own small dump trucks, so we typically help them more on larger job sites a...nd specialty projects with tight timelines. When a general contractor creates a proposal for a job, they decide whether waste disposal is included in the contract or not. Most of our contractors prefer to arrange disposal bin rentals through waste management companies like us, so that during certain stages of residential development they can more closely time the drop off and pick up of our waste bins. 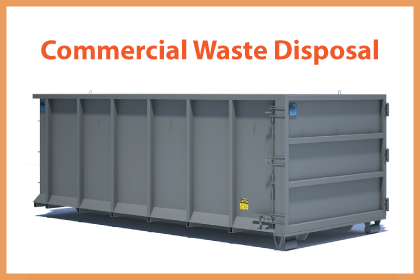 Often, within the agreements with each contractor that enters the site, the general contractor will pay for disposal costs direct...ly and allow the sub-contractors to use our bins. During other parts of the project, we remove our garbage bins completely from the property so their sub-contractors can either occupy more parking or use specialized disposal bins for greater recycling initiatives and other municipal requirements.